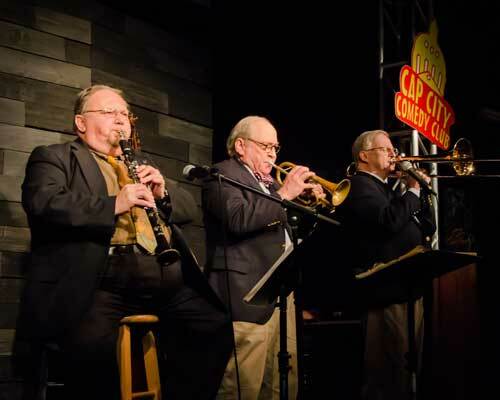 ATJS welcomes back the Jim Cullum Jazz Band, Sunday, April 14, 2019 from 2 to 5 pm. Last year the Jim Cullum Jazz Band brought the crowd to their feet for a standing ovation. Yes, it was that good! 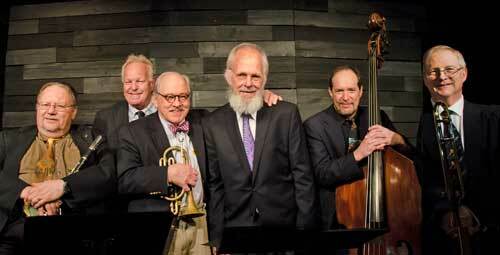 The jazz legend will return to play for the Austin Traditional Jazz Society on April 14 at Cap City. If this year's performance tops last year, you are in store for some amazing jazz. So get your tickets early as this concert will undoubtedly draw a huge crowd! When: Sunday, April 14 from 2:00 to 5 p.m. Doors open a little before 1:00 p.m.
Where: Cap City Comedy Club, 8120 Research Boulevard (intersection with Anderson Square) in North Austin. Features: Good food (kitchen open 1:00 to 4:00 p.m.), full bar to 5:00 p.m., (suggested minimum: 2 items, food and/or drink). Two dance floors, large free parking lot with unlimited overflow a block east. Hall holds up to 300 people — lots of room for all!